Spoonflower does custom printing of fabric designed by crafters, and recently they had a free swatch day to raise money for Heifer International, with a limit of 2 swatches. The first one was easy. It's one I planned to order enough of to make an apron as soon as I can work it into my budget, the other, I let my daughter pick from my collection of patterns I've drawn for different things, and she chose a rainbow I drew a few months ago. The original art can be seen here and here. 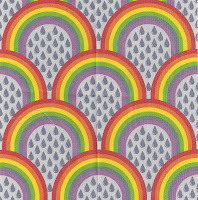 The rainbow swatch greyed out a bit, but I rather like the effect, and E likes it just fine. My pattern choice, I'm thrilled with how it printed. Because of the way Spoonflower protects artists designs, you can't order fabric with my designs from Spoonflower, but I can have it printed and sell it on Etsy if I'd like to. 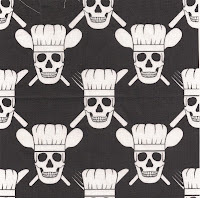 If there is enough interest, I may do that, I was thinking of making an apron kit up which will be the fabric, plus a patch pocket with a large motif on it.